Inducted 1994. 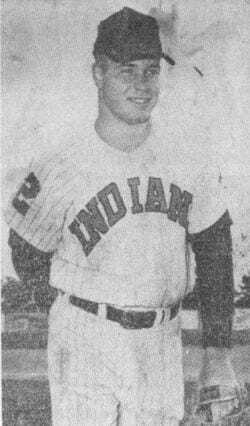 Only Two Losses in Hight School, Played in Cleveland Indians Organization. Class of 1960. Casburn was one of the best baseball players in school history and went on to play professional baseball for four years. A 1960 graduate of Christian Brothers High School, Casburn lettered for three years in football and for four years in baseball. He lost just two games as a pitcher for the Raiders, and his biggest highlight was pitching a no-hitter to defeat Quincy High School in the 1960 regional championship. Upon graduation, he signed a contract to play with the Cleveland Indians organization. He compiled a record of 40 victories and 28 losses during his career, and he was named to the Florida State League All-Star Game. He received the Topps Award for the Indians in 1962, and he was the Topps Player of the Month for August 1962 when he went 6-0 while playing in the Alabama-Florida League. Casburn retired from baseball in 1964 after rupturing his Achilles tendon, and he went on to Western Illinois, where he received his degree in education in 1967. He was placed on the voluntarily retired list by the Indians in 1972. He now is manager and executive vice president of Quincy Storage and Transfer. Casburn is a member of the board of directors for the Illinois Movers and Warehousemen’s Association, and also a member of the board for the Illinois Movers Tariff Bureau. He has been married to his wife, Sandy, for 29 years, and they have one daughter, Trina.